The PBE has been updated! 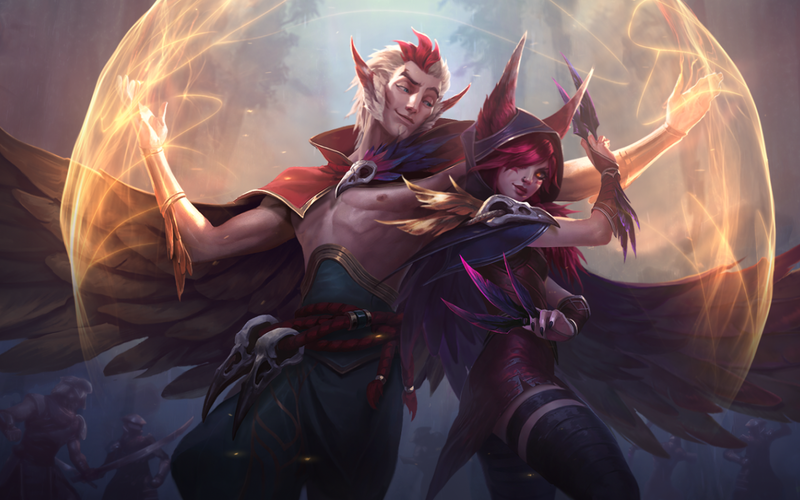 As we continue the 7.8 PBE cycle, tonight's update includes a login theme for our new champions Xayah and Rakan as well as more tentative balance changes! New login theme featuring Xayah and Rakan now on the PBE! Friend of the Forest (P) previous channel time nerf reverted - returned back 2.5 seconds from 3. 1) Meddler with a new Gameplay Thoughts for April 7th including discussion on the midseason changes that are starting to hit the PBE early and Karthus/Ryze spell buffering changes. We're at the point where we'll be putting some of the mid-season changes onto PBE a patch early and letting them soak there a bit longer. Many of the changes won't be there until the 7.9 PBE cycle starts though. It's also fairly likely we'll have some changes to support starting items there early next week as well. Those are focused on stuff like laning patterns (especially on Coin) and recognition of success. More details on that soon. As some of you may have seen in game or from screenshots posted elsewhere we've been conducting a few surveys recently to get players's thoughts on other possible names for the support position. We don't have any immediate plans to try and rename it, long term though, once we've done more work on the gameplay possible from that position we'd like to try and find a more appealing name than 'support'. Something that still recognizes how important team interaction is, but that also doesn't imply a secondary, less empowered role. We'd then be interested in changing the icon from something so ward like at the same time. Haven't found anything yet we're happy enough with, or that has gotten a strong positive response from players surveyed though. Words we've been looking at so far include terms like multiplier, flex, catalyst and specialist. As above even if we found a good replacement name players liked we'd also want to address gameplay issues first - renaming without doing so otherwise feels pretty empty/pointless. We've got a couple of changes to how Karthus and Ryze buffer their spells on PBE at present that are intended to make them a bit smoother to use, in particular on higher latency connections. Any feedback on those from folks with PBE access much appreciated. We're not mentioning specific details for now though on what's changed to see if there's anything good or bad that gets specifically noticed when you're not sure exactly what's changed." 2) A large set of midseason durability and itemization changes are currently testing on the PBE! Check out Riot Repertoir's PBE boards post for more information. These will not ship in 7.8. On April 7th, he posted a lengthy FOLLOW UP THREAD on the changes, addressing lots of feedback, questions, and concerns regarding the tentative changes. 3) PBE Sign Ups are closed due to website issues.